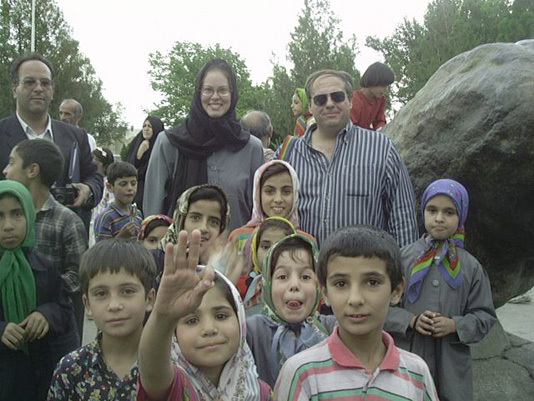 The Southwest Institute for Space Research [now the Earthrise Institute] had the unique experience and privilege of leading a small delegation of American scientists, students, and educators to Iran to view the last total solar eclipse of the 2nd Millennium on August 11, 1999. In addition to Institute founder Alan Hale, our delegation included Apollo astronaut Rusty Schweickart, solar scientists Doug Biesecker and Rock Bush, former Ambassador Bill Miller, and high school student Stephanie Lester from New Jersey. Because of some of the political difficulties involved the trip was touch-and-go until literally the last minute, but fortunately we were indeed able to go, and it was a trip that immensely touched all of us on the delegation. We viewed the eclipse -- in almost perfectly clear skies -- from a lakeside resort near the town of Chadegan (located approximately 130 km west-northwest of Esfahan) but, perhaps more importantly, we were able to meet and interact with the Iranian people. This included presentations at the Institute for Advanced Studies in Basic Sciences in Zanjan and at Lorestan University in Khorramabad, as well as numerous "people on the street" encounters. In all these instances we were deeply touched by the warmth and friendliness of the Iranian people. The Southwest Institute is proud and honored to have been a part of this demonstration that scientific events, such as solar eclipses, can be used to accomplish goals that go beyond science and that can benefit all of humanity. During the trip itself this page served as a clearinghouse where we attempted (not always successfully) to upload updates and images in "real time." Now that the trip is in the past we will use this page as a place to store our reports, our thoughts, and some of our photographs. As you read through these please take some time to think of some ways that you, yourself, can make this a better world for all of us. Rainbow Symphony, Inc. of Reseda, California, who donated 500 pairs of "eclipse glasses" for us to hand out to the Iranian citizens -- they were very popular! Meade Instruments Corporation, who had agreed to provide telescope and imaging equipment for our trip. Because of some difficulties in shipping we ended up not being able to utilize these, however we would nevertheless like to recognize their contribution to our efforts.